I’m getting awfully tired of Trump. This ProPublica report gives one reason. If we think of a library as a city and a book as an individual house in that city, each sentence becomes . . . IN the second century of the Christian Era, the empire of Rome comprehended the fairest part of the earth, and the most civilized portion of mankind. The frontiers of that extensive monarchy were guarded by ancient renown and disciplined valor. The gentle but powerful influence of laws and manners had gradually cemented the union of the provinces. Their peaceful inhabitants enjoyed and abused the advantages of wealth and luxury. The image of a free constitution was preserved with decent reverence: the Roman senate appeared to possess the sovereign authority, and devolved on the emperors all the executive powers of government. During a happy period of more than fourscore years, the public administration was conducted by the virtue and abilities of Nerva, Trajan, Hadrian, and the two Antonines. It is the design of this, and of the two succeeding chapters, to describe the prosperous condition of their empire j and afterwards, from the death of Marcus Antoninus, to deduce the most important circumstances of its decline and fall; a revolution which will ever be remem­bered, and is still felt by the nations of the earth. 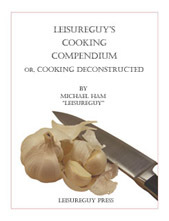 I can see the opening scenes of a Cinemascope movie with this as the voiceover. And, of course, I just purchased a novel based on its opening paragraph. A machine-learning study that analysed hundreds of thousands of earthquakes beat the standard method at predicting the location of aftershocks. Scientists say that the work provides a fresh way of exploring how changes in ground stress, such as those that occur during a big earthquake, trigger the quakes that follow. It could also help researchers to develop new methods for assessing seismic risk. “We’ve really just scratched the surface of what machine learning may be able to do for aftershock forecasting,” says Phoebe DeVries, a seismologist at Harvard University in Cambridge, Massachusetts. She and her colleagues report their findings on 29 August in Nature. Aftershocks occur after the main earthquake, and they can be just as damaging—or more so—than the initial shock. A magnitude-7.1 earthquake near Christchurch, New Zealand, in September 2010 didn’t kill anyone: but a magnitude-6.3 aftershock, which followed more than 5 months later and hit closer to the city centre, resulted in 185 deaths. Seismologists can generally predict how large aftershocks will be, but they struggle to forecast where the quakes will happen. Until now, most scientists used a technique that calculates how an earthquake changes the stress in nearby rocks and then predicts how likely that change would result in an aftershock in a particular location. This stress-failure method can explain aftershock patterns successfully for many large earthquakes, but it doesn’t always work. There are large amounts of data available on past earthquakes, and DeVries and her colleagues decided to harness them to come up with a better prediction method. “Machine learning is such a powerful tool in that kind of scenario,” DeVries says. The scientists looked at more than 131,000 mainshock and aftershock earthquakes, including some of the most powerful tremors in recent history, such as the devastating magnitude-9.1 event that hit Japan in March 2011. The researchers used these data to train a neural network that modelled a grid of cells, 5 kilometres to a side, surrounding each main shock. They told the network that an earthquake had occurred, and fed it data on how the stress changed at the centre of each grid cell. Then the scientists asked it to provide the probability that each grid cell would generate one or more aftershocks. The network treated each cell as its own little isolated problem to solve, rather than calculating how stress rippled sequentially through the rocks. When the researchers tested their system on 30,000 mainshock-aftershock events, the neural-network forecast predicted aftershock locations more accurately than did the usual stress-failure method. Perhaps more importantly, DeVries says, the neural network also hinted at some of the physical changes that might have been happening in the ground after the main shock. It pointed to certain parameters as potentially important—ones that describe stress changes in materials such as metals, but that researchers don’t often use to study earthquakes. The findings are a good step towards examining aftershocks with fresh eyes, says Daniel Trugman, a seismologist at the Los Alamos National Laboratory in New Mexico. “The machine-learning algorithm is telling us something fundamental about the complex processes underlying the earthquake triggering,” he says. . . This may seem puzzling since enrollment rates for Obamacare went down during signups for this year. But if fewer people signed up for Obamacare, how did the uninsured rate go down? The answer is pretty simple: the economy continues to be strong and more people are getting jobs—which means that a lot of people are probably dropping Obamacare and signing up for employer insurance. This demonstrates something important: Obamacare isn’t everything. For one thing, it’s a pretty small part of the overall health insurance market. It’s even a pretty small part of the public health insurance market. For another, Obamacare is meant to be part of the social safety net, something that’s available to people if they need it. But like food stamps and unemployment insurance, we’d all prefer that the number of people who need it goes down. Over the past year or so, as the unemployment rate has dropped below 4 percent, the number of people who need Obamacare has almost certainly declined, and this accounts for some of the decline in enrollments. Personally, I don’t think it accounts for the entire decline. Trump’s attempted sabotage probably had an effect too, though it turns out that he screwed up and did a poor job of sabotage. Generally speaking, however, it looks like there’s a pretty steady share of low-income workers who are willing to pay for Obamacare, and that doesn’t change a lot even when states and the federal government actively try to screw things up. Enrollments go down a little bit if people switch to employer insurance and go up a little bit when competition makes coverage more affordable. Overall, though, these are pretty small effects. Obamacare has done what it can, and that’s not likely to change much until we either improve it or Trump succeeds in destroying it. Donald Trump is a dangerous, authoritarian leader who was elected by appealing to racism and is overtly trying to undermine democracy. He is an embarrassment to the American people and the United States. Despite these facts, or perhaps because of them, Trump remains remarkably popular among Republicans and his other diehard supporters. This is a cause of constant handwringing, confusion and consternation among many American journalists and other members of the chattering class. As former Salon editor Joan Walsh recently wrote in the Nation, this is a “distracting journalistic exception.” But it does no good waiting for Trump’s flock to abandon him, and the frustration only grows. Ultimately, Donald Trump is a riddle that the fourth estate has intentionally chosen not to decipher. His enduring popularity is not that complicated — for those who choose to see the depth of the political, cultural and social crisis that goes back decades and spawned Trump’s presidency. Here are 15 reasons why Donald Trump’s loyalists have not abandoned him and likely never will. Donald Trump is a political cult leader. Consequently, his supporters will not abandon himbecause to do so would cause great emotional and spiritual harm to themselves. Trump has repeatedly shown that he is a racist who harbors deep animus and hostility towards nonwhites and Muslims. These values and attitudes are shared by his voters and other supporters. As recent research demonstrates, at least 11 million white Americans possess “white nationalist” beliefs, while many millions more are sympathetic to such politics. Other research suggests that the more Trump’s racist behavior is criticized, the more his supporters are likely to defend him. Political parties are now extensions of personal identities. As a result, in America, and other failing democracies, politics is treated as a team-sports event. This is especially true for Republicans and other conservatives who now view those groups most associated with the Democratic Party (women, nonwhites, “liberals,” immigrants, gays and lesbians and others) as being their personal enemies. Democrats do not feel the same animus towards those people (whites, especially white men and evangelical Christians) most associated with the Republican Party. Political compromise in the interest of the common good is made nearly impossible. Trump’s apparent incompetence as evaluated by traditional measures of governance such as respect for democracy and the rule of law are viewed as positives by his supporters. Criticism of Trump’s leadership style and other behavior are viewed as the complaints of “elites” who look down on “real Americans.” The anti-intellectualism that has long been a core tenet of American conservatism has fully bloomed, first with Sarah Palin and then with Donald Trump. As they erred in their assumptions about Donald Trump’s chances of victory in the 2016 presidential election, traditional journalists and other pundits are making many of the same errors again. As a class, journalists and other supposed political experts still cling to the belief that the American people are good, decent and “moderate” — despite all the evidence, including Trump’s victory, suggesting the opposite. There is also a misplaced faith in the enduring health and power of the country’s democracy and the role of citizens in it. Political scientists Christopher Achen and Larry Bartels intervene against this worship of “folk democracy” in the concluding paragraphs of their book “Democracy for Realists“: . 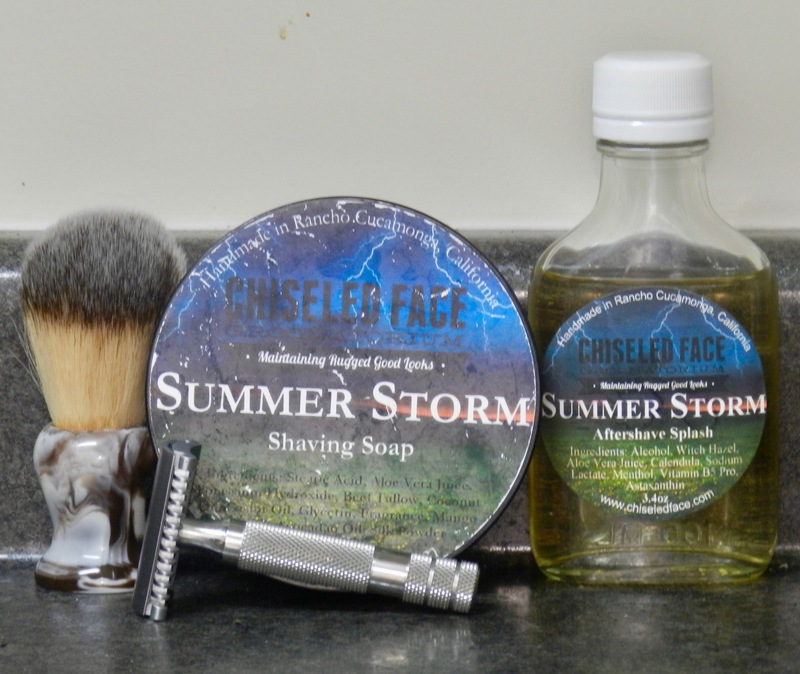 . .
A friend mentioned the fragrance of petrichor following a storm in Seattle, and so I decided that I also would enjoy the fragrance, which is prominent in Chiseled Face’s Summer Storm shaving soap and aftershave. The lather’s excellence went well beyond the fragrance, and then my iKon Shavecraft 101 smoothed away all traces of stubble, comfortably and efficiently. 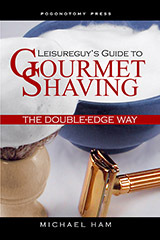 A rinse, dry, and splash of the aftershave (after shaking it well), and I’m ready to (Nordic) walk. In August 2016, McIlvaine was offered a job at Mercy Corps, a nonprofit in Portland, Oregon, which came with a $10,000 raise and great benefits—the extra security she believed would allow her to start a family. But Mercy Corps required a credit check, and McIlvaine discovered that FedLoan had never actually dealt with that $1,600 bill, instead reporting it as 90 days past due and plunging her previously excellent credit score to an abysmal 550. When she called FedLoan in tears, she recalls, she was treated dismissively and told to “pay more attention” to her loans—and again the only option offered to her was to take an administrative forbearance while the company sorted out the issue. Ultimately she got the job, but only after she lodged a formal complaintwith the Consumer Financial Protection Bureau, the watchdog agency created during the Obama era, which prompted FedLoan to send her a letter in October 2016 claiming the company had fixed the issue and that her credit had been restored. “But in true FedLoan Servicing style,” she told me, “they only contacted two of the three credit bureaus.” It took several more months to fix her score with the third bureau, Equifax. FedLoan declined to comment on McIlvaine’s tribulations. But as complaints to the Consumer Financial Protection Bureau and lawsuits against the Education Department and FedLoan pile up, she’s hardly alone. 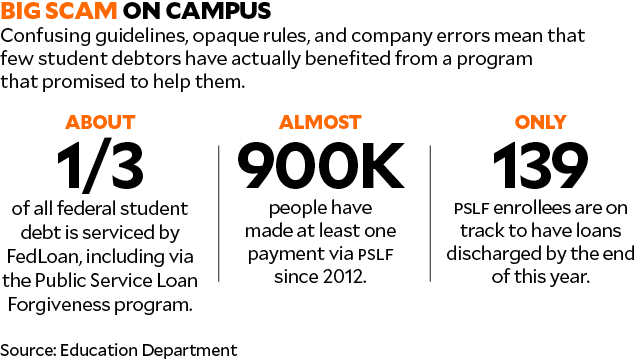 In 2017, the bureau issued a report excoriating FedLoan for mismanaging PSLF, misleading borrowers, and losing track of payments. The previous year, the American Bar Association had filed suit against the Education Department for reneging on its own rules about how the program was supposed to work and who was eligible for forgiveness. Then, in August 2017, . . .